Dangers abound for the insouciant child, but by far the most treacherous waters to navigate are those of socialization. The survival of one’s formative years is largely dependent upon the learning of arbitrary rules hatched by adults. Even so, where matters of protocol were concerned, I excelled. I rather enjoyed the code of it. I was a quiet child, detail-minded, generally thoughtful, and courteous to a fault. My single downfall, if it could be so called, was that I didn’t like to use peoples’ names. It’s not something I had never articulated, and no one had ever commented on it to me. But in fact my entire childhood was geared toward determining how to meet my needs without using anyone’s name. These aren’t conscious decisions one comes to, but innate inclinations one happens upon in the course of self realization. For two years I was able to get by without saying my babysitter’s name. Whenever one of the other kids asked her for something, I could simply attach a “Me too, please!” to the request, and I’d be in. My technique was transparent, and all the more compelling for the “please,” at the end. The “please” is the bane of most kids’ existence. Every book on etiquette obsesses over the necessity of the “please.” And why not? It is, after all, the most important bit. Luckily for me, that word never presented a problem. I savored it, in fact, and the word dropped from my lips like silk. One of life’s lessons that always comes too late is that avoidance only makes the inevitable worse. I’m not sure how it happened, but something was stuck in my babysitter’s craw the day she made me learn it. I recall running into the kitchen from the heat of a summer afternoon with one of the other children. I always took particular care not to let the screen door slam shut, so thoughtful was I. “Mrs. Dutrow, can I have a glass of kool aid?” asked Mark. “Me too, please!” I said. My babysitter retrieved a single plastic cup from the shelf, filled it with cool sugar water, handed it to my colleague, and then regarded me cooly. “Say my name,” she said to me. My friend took this as his cue to exit, while I stood rooted to my spot on the worn kitchen linoleum. “What?” was all I could muster. There’s nothing like running headlong into an invisible barrier that leaves you questioning your most basic assumptions. What had just happened? I ran the scene through in my head again, but I couldn’t find anything out of place. Sure, there was the tug of guilt because I knew exactly what I’d been getting away with. Yet I couldn’t believe that she would actually confront me about my disinclination to call people by their names. It seemed an outright violation, if not a cheap grab for control. “You never say my name,” she said. “You never say anyone’s name.” And there it was, the ugly truth. She might as well have said, “You’re short and slightly cross-eyed,” but that would have been stating the obvious at least. This was different. Like that she had just laid out my secret. Fifteen other children under her daily care, and she didn’t care in the least that any one of them might have overheard. So doesn’t that make me precious? All the more reason to cultivate my unique personality! But no, she was after some kind of behavioral homogeneity. I didn’t have the words for those thoughts, so I did nothing but stammer, which is probably the worst thing a child can do when confronted. It’s tantamount not only to admitting one’s guilt, but also to intent. “From now on,” she said, and my heart sank. Nothing good ever followed that phrase. Never was a from now on heard that was followed by something as wondrous as there will be more cake. From now on no dentists. From now on no more report cards, no baths, no girls, no dog walking, no silverware. My babysitter handed down her sentence with cool conviction. “From now on you won’t get a drink unless you ask me properly,” She said. Great, so I had to use her name and I had to say “please,” leaving little room for improvisation. There might as well have been a button to press that triggered the preapproved phrase, I thought. The grace in any interaction comes from the thought behind the question. The poetry lies in the gesture. So what of the phrase bleated out by rote? The idea of summoning someone by name was one I found repugnant, just as if my babysitter had ordered me to kiss her on the lips each time I wanted a glass of juice. Was using a person’s name any less intimate? It seemed to me that a name was such a personal thing that it should never be used in public, and should in fact be regarded as nothing less than a secret. Just as the fact that I didn’t like saying names had been a secret. But that was of no concern to her. 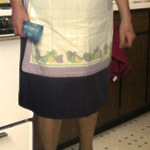 She was still looking down at me, while I glowered at her stupid apron. I hated her then; her authority. Tired of the conversation, I stifled a sigh. “So, would you like something to drink?” she asked. Aha, now it was my turn. Now I would show her. “No,” I said. See? Wasn’t even that big a deal to me. Even though my teeth were chalk dry. I would drink out of the toilet before she could make me say her name. In that I was resolute, but I couldn’t make my defiance known. I had to stand there, cheeks flush, until she signaled that I was dismissed from this dreadful engagement. “Fine,” she said, and went back to dreaming up ways to torture children. I was free to go. At lunch the next day the children gathered at their respective tables, and waiting by my plate was my empty glass, mocking me. “Let me know if you’d like something to drink, okay, Jeffrey?” said my babysitter. Stupid idiot. “Okay,” I said. “Why aren’t you drinking anything?” asked Aimee next to me. “I’m not thirsty,” I said. My babysitter had ruined everything for me, which, by my estimation, is what adults generally did. I’d had my routine, I’d never been less than polite, and no one had ever gotten hurt. But now my punishment was a matter of public scrutiny, which was fine by her. She wanted me to have to answer for it, despite the fact that if word got out that I didn’t say peoples’ names, they’d be on me like dogs. From now on I would have to be completely self-sufficient. I couldn’t ask for anything. I had no recourse, I would basically have to disappear. I would grab crumbs and drink from the table when no one was about. I would be a ghost. And then, at last, no one would want me to say their name. If only my babysitter would let me leave the lunch table, that is. “May I be excused, please?” I asked. It is always hard to know who is the more unreliable of narrators, a grown up fiction writer, or a secretive child. Both get deep into plots of great intrique, dependent on on how well, or deceptively, they are told. So, hurrah! When the one is reminiscing about the other, the possibilities multiply, of course, and the truth becomes so wholly out of reach that a reader can only kick back and watch.